The Impreza represents a very solid choice in the compact segment. When old man winter hits, many people rely on a Subaru to prevent them from being stranded. 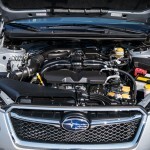 Renowned for equipping (almost) every single one of their vehicles with all-wheel drive, Subaru has developed a reputation for building safe, reliable, and affordable cars that offer superior traction in slippery conditions. 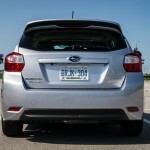 The entry-level Impreza nameplate has been a strong seller since the 1990s, and has always been available in several body styles, including sedan, hatchback, and even a raised off-road variant in the Outback / XV Crosstrek. I brought home a 2015 Subaru Impreza 2.0i Sport Package 5-door – can it prove its superiority in the heat of the summer, when grip is plentiful? 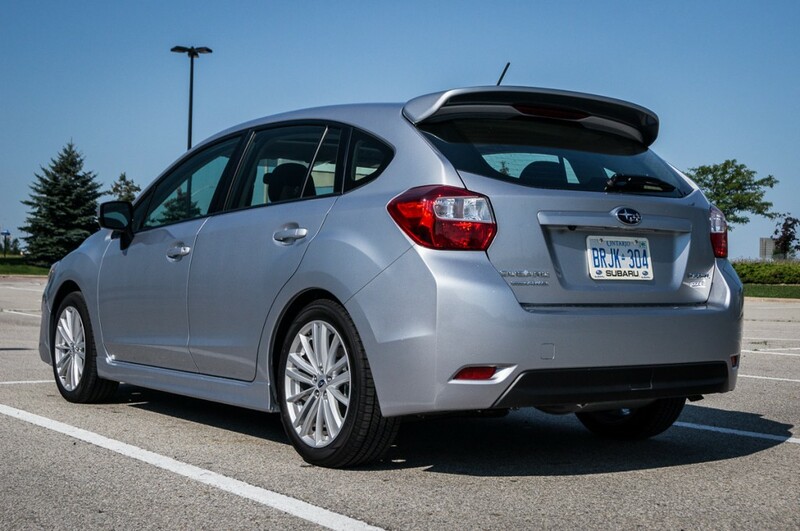 In Sport and 5-door trim, the Impreza provides added utility thanks to its hatchback configuration. 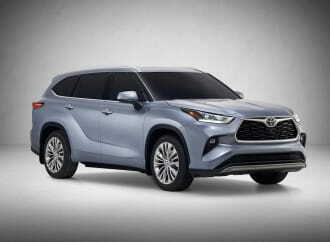 Being two steps up from the base 2.0i and 2.0i Touring trim levels, the Sport boasts features such as automatic climate control, fog lights, sunroof, and 17-inch aluminum-alloy wheels. 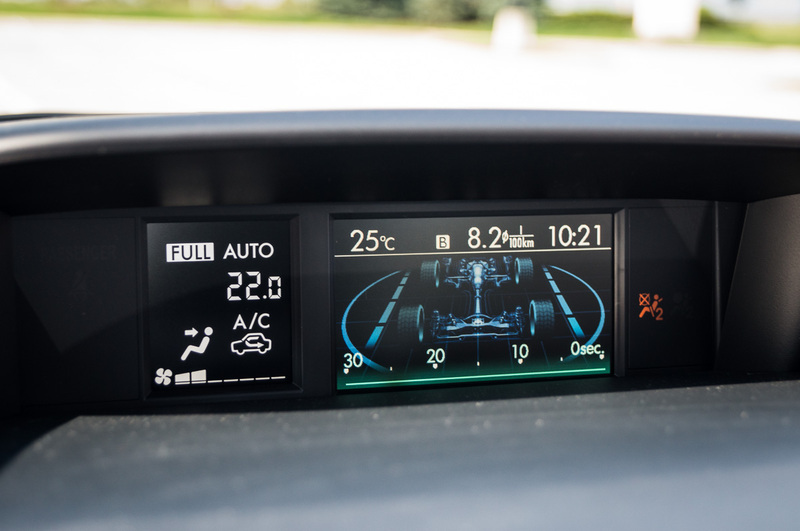 Additionally, an upgraded 4.3-inch information display screen provides gamut of information for drivers: fuel consumption graphs, monitors for the all-wheel drive system, and engine fluid temperatures are just some of the parameters that can be displayed. In terms of infotainment, the Sport Package makes do with six speakers and a “STARLINK” 6.2-inch touch screen display that includes Bluetooth pairing, auxiliary input, and SiriusXM satellite radio. 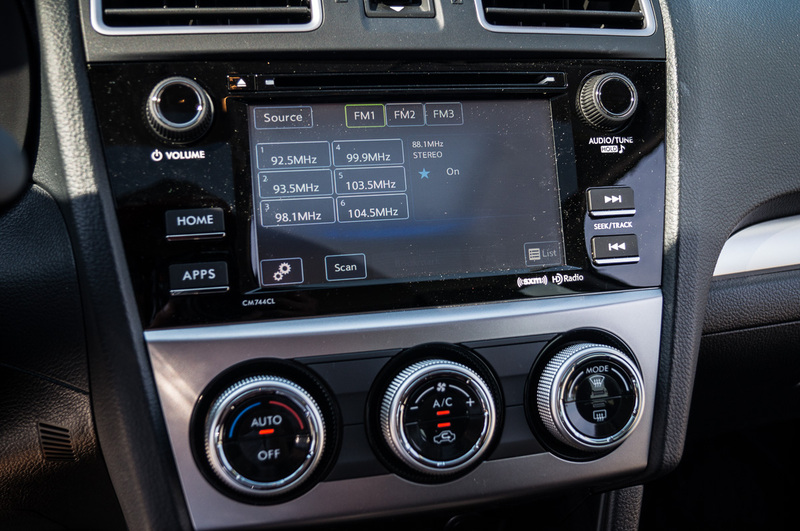 Oddly, sound quality was an issue when using the Bluetooth audio streaming function on this and other STARLINK-equipped Subaru vehicles, although this may have been an anomaly afflicting one specific smartphone. 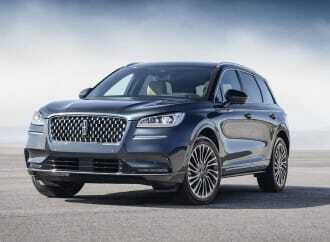 Functionally, the infotainment does its job well, although the look and feel of the system isn’t quite as refined as offerings from other manufacturers. 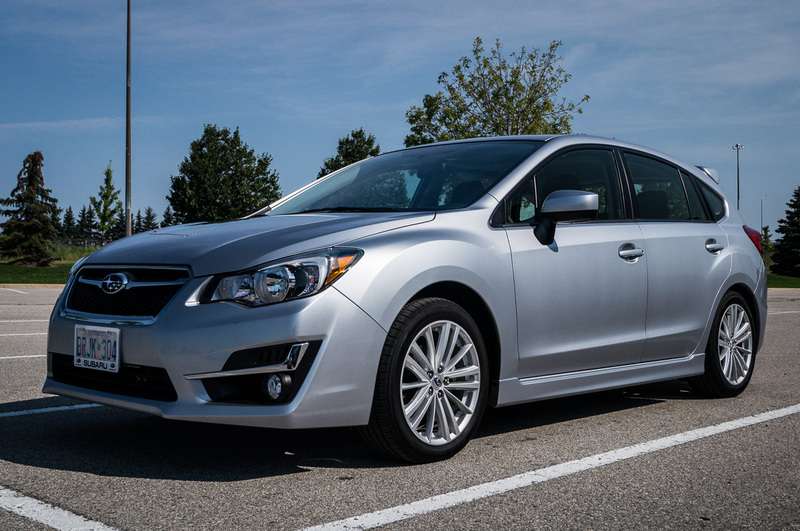 For drivers and passengers alike, the Impreza is a good, no-nonsense place to spend time. 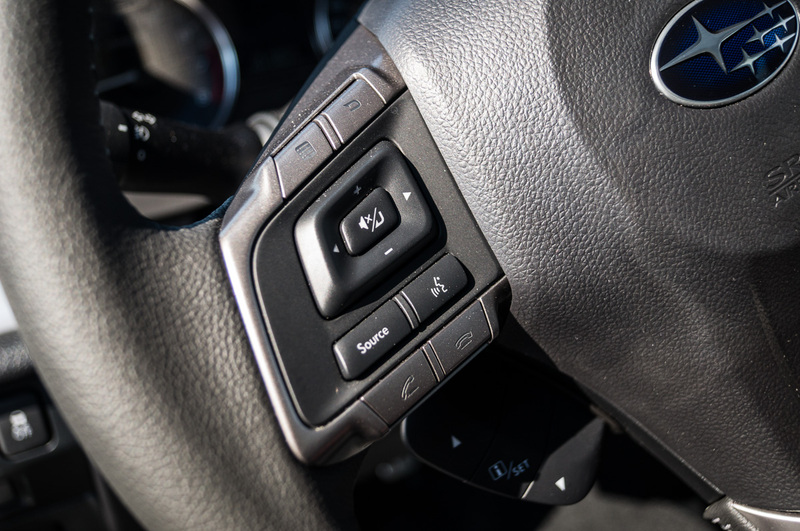 The interior is of improved quality compared to Subarus of old – the switchgear and touch points feel more substantial, and the plastics look much less chintzy. 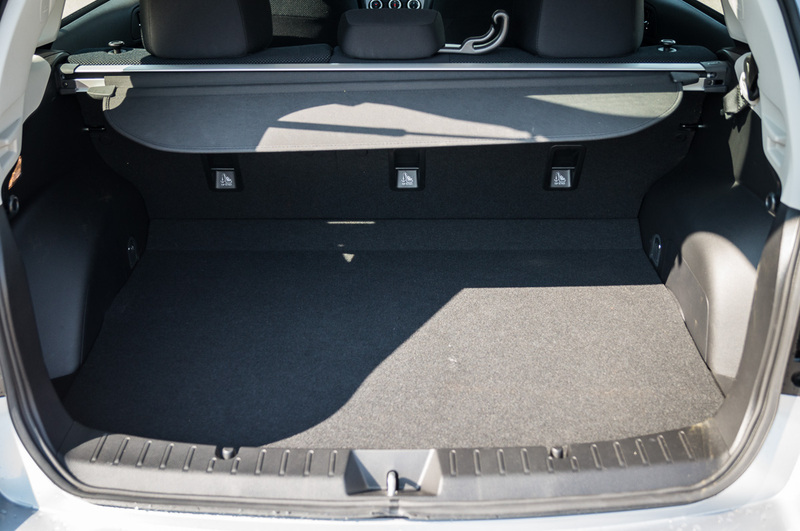 The manually-adjusted front seats are wrapped in a durable-feeling cloth and are fairly flat, but no aches and pains were felt during driving stints up to an hour in length. 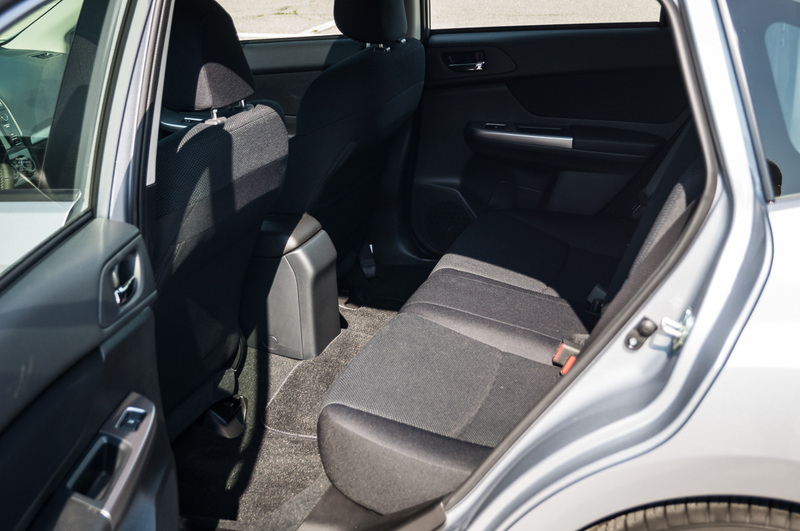 In the rear, passengers or pets will have a decent amount of legroom, though taller front-seat passengers putting the seats rearward may cause more cramped conditions. 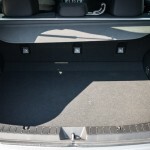 The hatchback configuration is great for hauling cargo, especially with the seats folded. A retracting privacy cover is included, in order to keep belongings hidden from prying eyes when the hatch is closed. 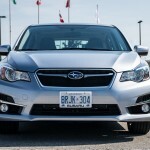 Under the hood, the Impreza has a 2.0-litre, dual overhead cam horizontally-opposed (“boxer”) four-cylinder engine. 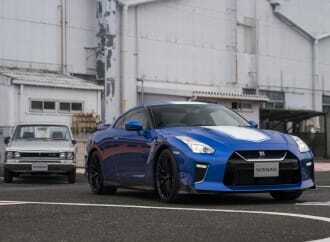 Power output is 148 horsepower at 6,200 rpm, and torque is rated at 145 lb-ft at 4,200 rpm. 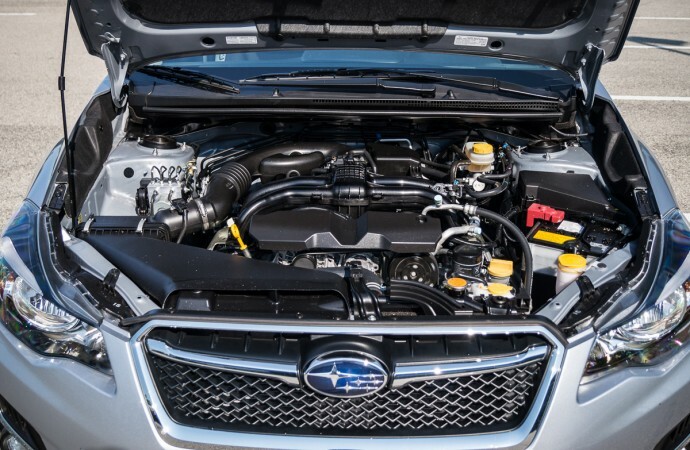 Although this is a smaller engine with lower output compared to the last-generation Impreza, the current model’s 148 hp moves things along with a reasonable sense of urgency. 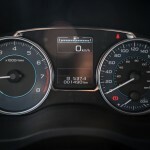 As the tachometer swings past 3,000 rpm, the boxer-four lets out a hearty snarl that many Subaru owners are already familiar with. Low-end torque and throttle response are also good points, which makes things easy when cutting through dense urban traffic. Equipped with a 5-speed manual transmission, our test car made for a more engaging drive compared to the expected volume seller automatic, which is of the continuously variable transmission (CVT) variety. The clutch engagement is low and near the floor, with the clutch grabbing quickly. This made launches a little less than smooth, although with only 1,000km on the odometer, things could get better once the clutch gets a chance to properly break in. The shifter has long but accurate throws, with a little bit of play and rubbery feel. 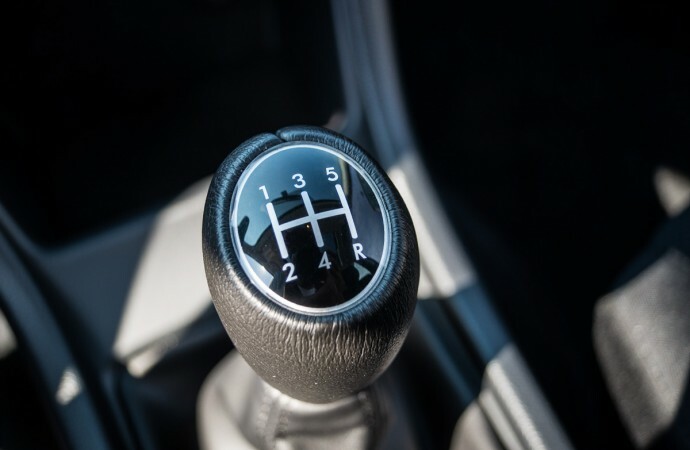 Shift-for-yourself enthusiasts won’t be particularly disappointed by this gearbox, but Honda and Mazda are still the experts with it comes to shifter-clutch feel. The drive-by-wire throttle calibration also created some frustration, with slightly delayed throttle response with fast pedal inputs. Rev hang was also an issue, with the rpms slow to drop during shifts. Although all Impreza models are equipped with all-wheel drive, vehicles with the 5-speed manual transmission have a fully mechanical viscous-coupling, limited-slip centre differential. 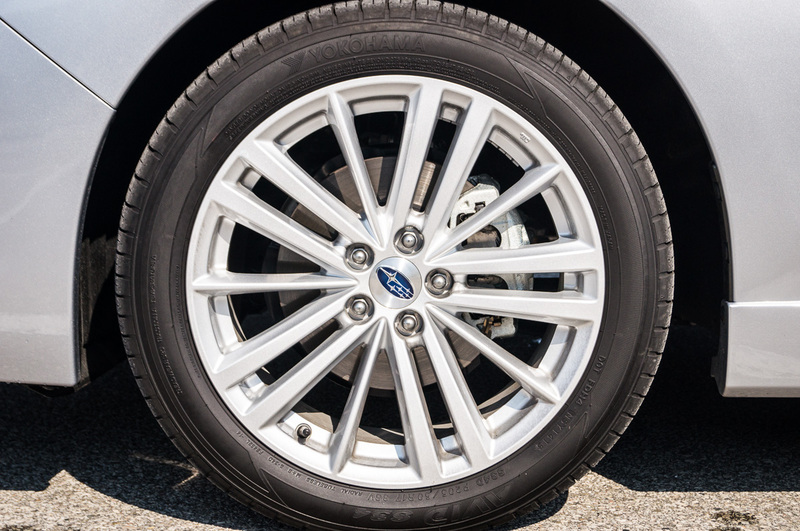 Automatic (CVT) cars employ an electronically controlled clutch. 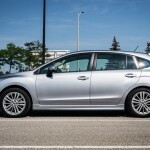 With great summer weather all week, the real-world differences of the two all-wheel drive systems are nil, however there is something to be said of the simpler mechanical viscous coupling on the manual Imprezas. It could be inferred that a simpler system will offer less repair and financial headaches down the line as the car ages. Subaru has designed the Impreza with a MacPherson strut front suspension, paired with a double wishbone setup in the rear. Spring stiffness is set on the soft side, as is the shock absorber dampening. This created a fairly compliant ride, but felt slightly bouncy on large expansion joints and frost heaves. Thankfully, handling response is fairly lively, with decent turn-in response. 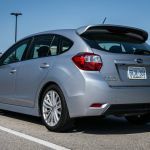 The electrically-assisted rack and pinion steering had good weighting and makes the Impreza easy to drive, but as with many modern electric setups, was numb and lacking feedback. 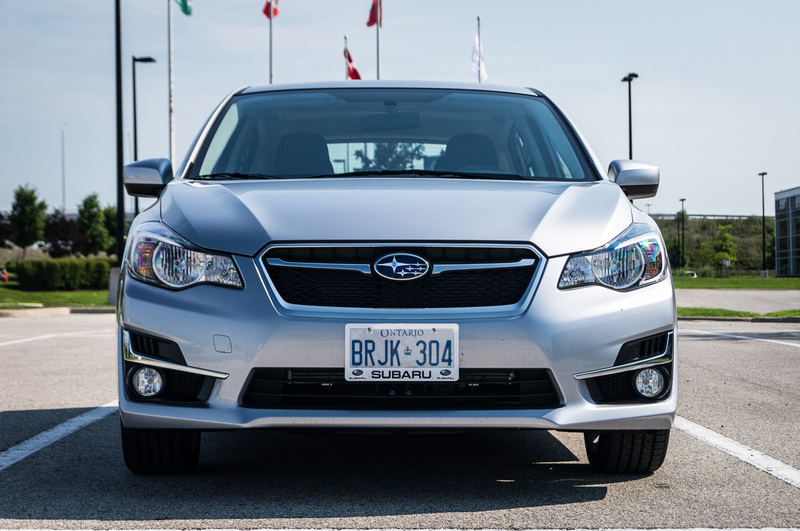 When the weather is bright and sunny, the Impreza’s all-wheel drive inherently causes a fuel economy penalty, due to extra weight and a system with full-time engagement (the system doesn’t decouple and run only two or rear-wheel drive under normal conditions). 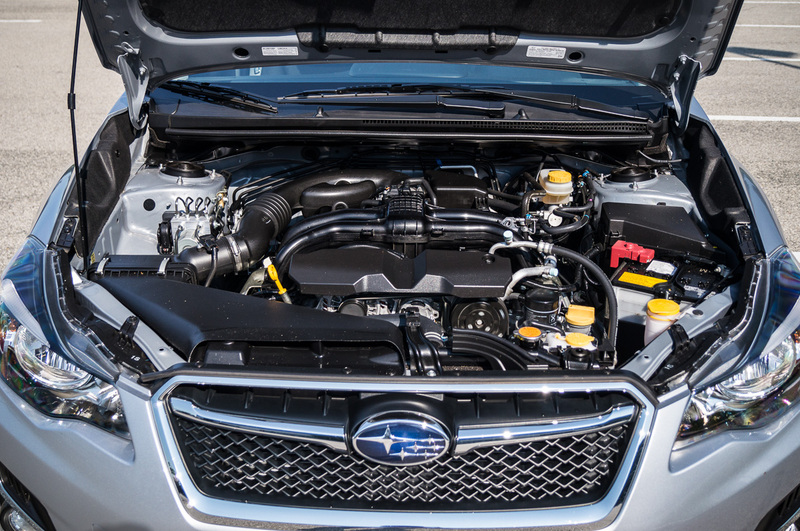 Subaru rates the 5-speed manual cars at 9.5 L/100km in the city, and 7.0 L/100km on the highway. 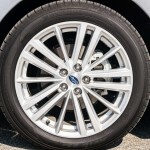 Observed test economy split the difference, with 8.2 L/100km, with a significant amount of highway driving – almost 10% worse than expected economy of front-wheel drive competitors such as the 2.5L-equipped Mazda3, or the uplevel Honda Civic Si. The gap grows even larger when considering competitors’ lower trim with smaller engines. 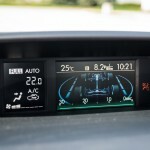 While watching the instantaneous fuel economy readout on the upper information display, it was difficult to achieve the rated 7.0 L/100km at highway speeds and flat ground. 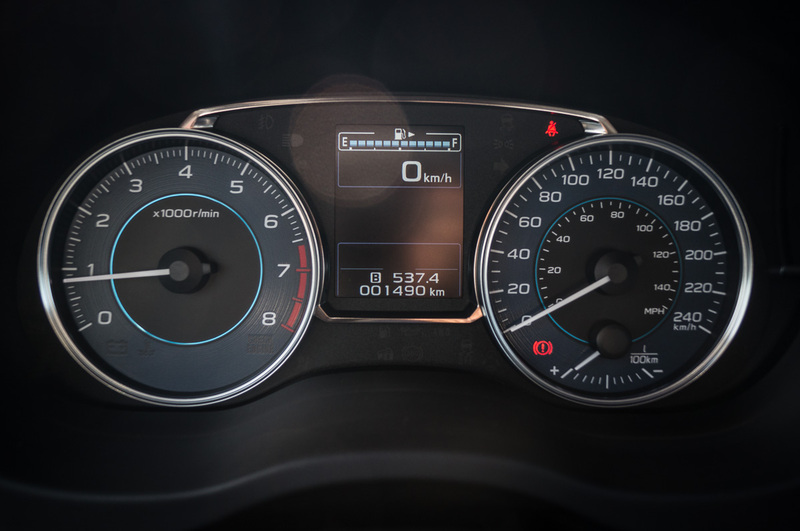 The short gearing of the manual transmission did not appear to help, with the tachometer reading between 2500 to 3000 rpm at typical Ontario 400-series highway speeds of 100 to 120 km/h. CVT equipped automatic versions, with a broader spread of gear ratios, are rated at 8.5 L/100km city and 6.4 L/100km highway. 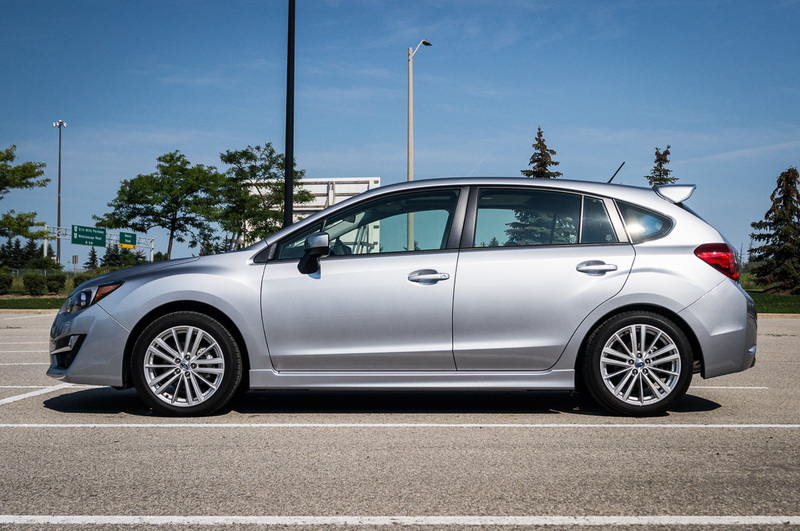 At an as-tested price of $24,795, the Sport Package-equipped Impreza 5-door slots itself nicely in the compact segment. 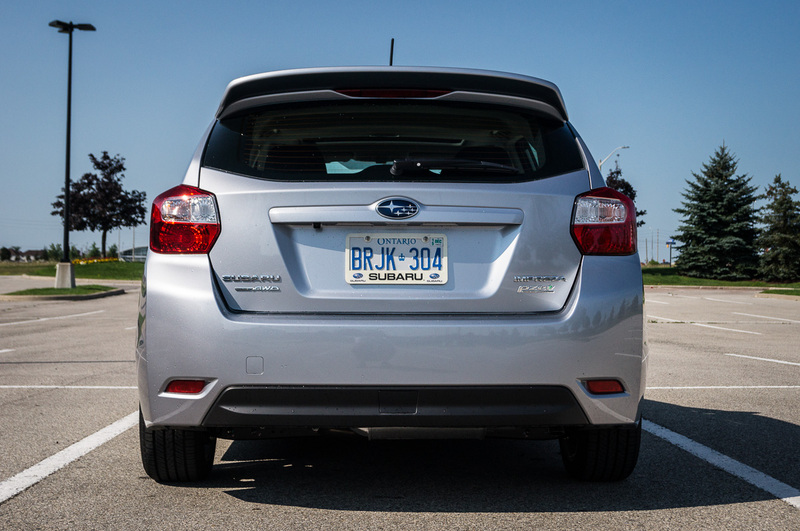 With a good range of features, decent performance, but so-so fuel economy, it is an ideal choice for those who need the utility of the hatchback format, and require the all-wheel drive for inclement weather traction (proper winter tires are still highly recommended!). 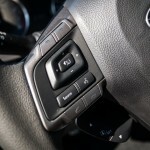 Nixing the all-wheel drive requirement allows for the consideration of the Mazda3, Ford Focus, and the newly-released Scion iM. 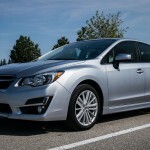 At the end of the day, the Impreza represents a very solid choice in the compact segment, but it isn’t the only choice.